There seems to be a further delay in the completion of the much-hyped Lakkar Bridge project. The much-hyped 933.162-meter long Lakkar Bridge project has hung fire since 1997. 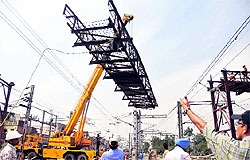 It is a clear reflection of the sad state of affairs in the state government as well as the Railways. Poor man’s cycle will cost more. 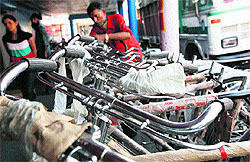 The prices of bicycle are set to rise by 3 to 4 per cent once the excise and import duties on parts are hiked. While the prices of bicycles will increase in the local market, those imported are also set to rise. VP Singh, superintendent in the Customs Department here, was caught red-handed by CBI sleuths for accepting a bribe of Rs 1.5 lakh from a customs clearing agent. In the Union Budget announced yesterday, Finance Minister Pranab Mukhrjee announced special grants to five agricultural universities of the country. The UPA chairperson, Sonia Gandhi, had promised a grant of Rs 100 crore to Punjab Agricultural University (PAU) for infrastructure development during the election campaign of the Congress. Foodie and footloose Ludhianvis have hit a speed breaker. Those, who love travelling, will have to shell out more for staying in hotels. Eating out has also become expensive for food lovers. Usually with development, nuclear families increase and the joint family system starts taking a backseat. But in the states like Punjab, Haryana and Gujarat, joint families continue to thrive. Going by Census 2011, the percentage of joint families in Punjab is the fourth highest at 23.9 per cent, followed by UP, Rajasthan and Haryana. Remember the days when you used to get unnamed envelopes containing advertisements and promotional material of companies or newly opened showrooms the neighbourhood? Ten days after five persons, including a woman, were booked for defrauding Nirmal Baba, a spiritual guru, of Rs 1.07 crore; it has come to light that a city-based businessman and an insurance adviser, too, were behind this conspiracy. Dr Vikas Jindal, a resident of the city, was elected vice-president of the Punjab Dental Council today. He secured 11 out of 18 votes. Craze for foreign pastures has failed to dampen the spirit of Roop Singh Roopa, an NRI, from serving his motherland. He has mooted and executed several novel plans for the upliftment of educational and health facilities. 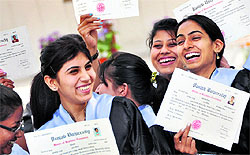 The annual convocation of Guru Nanak Girls College, Model Town, was held here today. Dr Gurbachan Singh, Chairman, Agricultural Scientists Recruitment Board (ASRB), New Delhi, was the chief guest on the occasion. 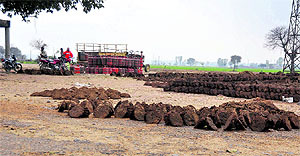 In a view of the weather warming up this month, home scientists of the Punjab Agricultural University (PAU) have urged the farm women and the home makers to pay utmost attention to home cleanliness, child care, health and diet, seasonal food intake, storage of winter wear and purchase of summer wear clothes. The College of Nursing, CMC, celebrated Alumni Day here today. The induction ceremony was started by word of prayer followed by presentation of mementos and badges to the new members. Prof Ponnamma R Singh, Principal, College of Nursing, introduced the chief guest, Prof H Asha Emmanuel. Hitesh Sood, a resident of the Gaushala Road, Police Division No. 3, was robbed of cash, two gold rings and a laptop worth Rs 1.5 lakh last night, about 200 meters from his house. This incident took place while he was returning from Haibowal. Despite making rounds at the Police Division No. 3 for registering an FIR, the police seems to be reluctant to register a case. The, complaint, however, written on a piece of paper. A local resident Amit Sharma and his wife Monika Sharma escaped when a "gang" tried to kidnap them. Though the police had not registered any case till the filing of this report, the couple alleged that they were being "followed" by several youths from Jagraon till the railway crossing near Sacred Heart Secior Secondary School, Sarabha Nagar here. The 7th edition of the annual sports meet for the employees of the Dayanand Medical College and Hospital and the Hero DMC Heart Institute was held here today in which a large number of participants competed for various sports events and fun games. 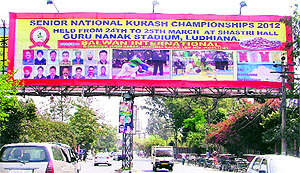 The Punjab Kurash Association (PKA) and the District Badminton Association (DBA)- the two city-based sports associations-have locked horns over holding a national martial arts competition at Shastri Badminton Hall near Guru Nanak Stadium.